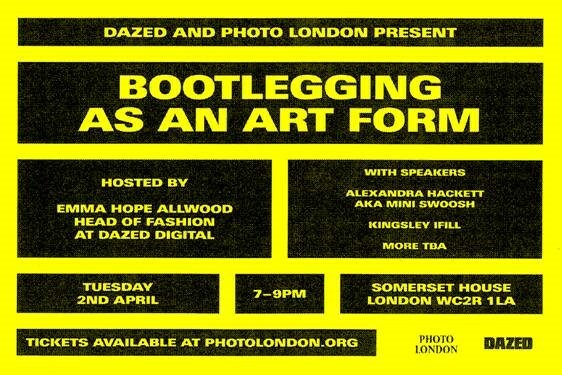 Dazed and Photo London present Bootlegging as an Art Form, a discussion between Alexandra Hackett aka ‘Mini Swoosh’, Kingsley Ifill and Charlotte-Maëva Perret, moderated by Dazed’s Head of Fashion Emma Hope Allwood. The conversation will explore ideas and examples of how brand imagery and iconography have been re-appropriated to transcend their original intentions – transforming them with new meaning and ultimately new audiences. Alexandra Hackett is an explorative menswear designer based in London. Her brand, Studio ALCH, focuses on exploring the process of deconstruction and reconstruction, to extend the lifespan of a product. Alexandra specifically focuses on reconstructed Nike products and has worked directly with the brand on a number of different projects, including her participation in Nike’s global Vote Forward Campaign in 2017 where she was invited to design her own Air Max. Kingsley Ifill is an artist based out of Herne Bay, Kent. He works across painting, printmaking, photography and other art forms to create unique and arresting imagery. Previous exhibitions include: Stutter, Cob Gallery, London 2016, like a rat up a drain pipe, Soho Revue, London 2017, Mute, Golborne Gallery, London 2017, Last Sip First, Pleasewait Gallery, Paris 2018 and Bouquet, LNCC, London 2018. Ifill has an upcoming solo exhibition in June at V1 Gallery in Copenhagen. Charlotte-Maëva Perret (born 1988, in Nouméa, French Polynesia) is an artist, entrepreneur, art director and academic who lives and works in London. Her Brandscape Art™ explores invisible languages of resistance often through collections and reconstructions of existing material. ©MP is concerned with the production of reflective objects and mythologies of collective freedom through what can be described as subversive modes of production and communication.